While most people are outraged over Rep. Ilhan Omar's (D-MN) anti-Israel declarations (as they should be), we should also highlight similarly shocking sentiments from her colleague, Rep. Rashida Tlaib (D-MI). In a new video for NowThis, Tlaib explains why she is one of the first U.S. lawmakers to support the Boycott, Divestment, and Sanctions movement, a campaign designed to punish Israel for its occupation in the West Bank. 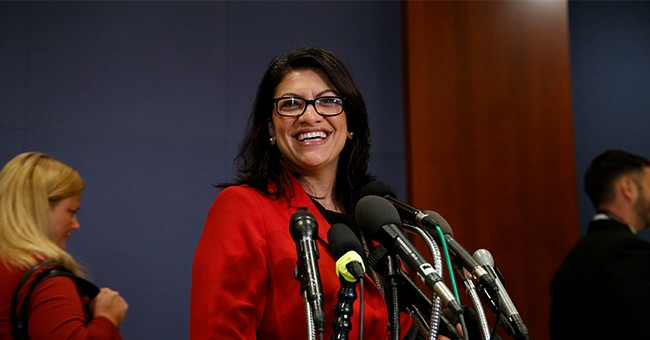 Tlaib defended the BDS movement as a harmless economic boycott. It calls for boycotts of companies that do business with Israel, divestment from Israel-affiliated institutions, and sanctions against Israel, including expulsion from the UN. The representative explained that supporting BDS was her opportunity to let the Palestinians' voices be heard, including her grandma, who lives in the West Bank. "Many of those Palestinian women and children and all those folks, are not at the table when these discussions happen about how various policies by both Israel and even maybe the leadership in Palestine, how it impacts their lives on an everyday basis," she continued. Tlaib doubled down on her belief that BDS is a matter of the freedom of speech, but Sen. Marco Rubio (R-FL) couldn't disagree more. He's introduced an anti-BDS bill that would punish companies who participate in the campaign. We also recently learned that Tlaib wrote a column for Nation of Islam leader Louis Farrakhan's publication Final Call. Farrakhan's anti-Semitism is well documented. Finally, Tlaib has informed her colleagues she won’t be attending AIPAC’s annual sponsored trip to Israel. Instead, she is organizing a separate trip to the West Bank. Omar has taken aim at AIPAC herself as of late. In her "apology" for her anti-Israel musings on Monday, she criticized the pro-Israel lobby.